Hello beautiful people, I hope you’ve been well. This blog post has been a long time coming, and as I have to dash in a bit – off to watch some sumo wrestling for the first time ever – this will be short and sweet. Perfume is one of the steps I forget when I’m getting ready in the morning every day; I only remember it for special occasions, which means that I take ages to get through them. I have had my “going out” fragrance for more years than I care to admit to since it’s so shameful. Keeping a perfume at work would probably remedy this, but I can never be bothered to put any on once I’ve arrived – I just get stuck in with my tasks for the day. I wasn’t even looking for a perfume when I was wandering around The Body Shop the day that I picked this up. 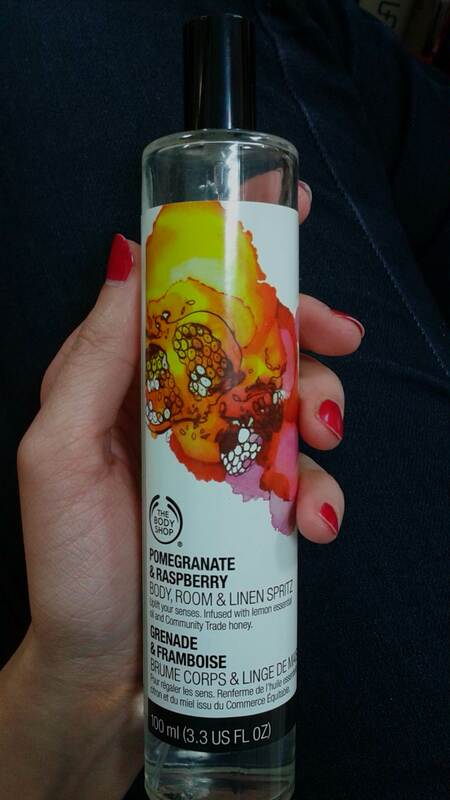 I was looking at their room scent products when I just sniffed this Pomegranate and & Raspberry Body, Room & Linen Spritz. I fell in love with the lightness and fruitiness of it, and decided I had to have it. I felt that it was’t too expensive either – the current price is 1,620 yen for 100ml (although I’m pretty sure I bought mine before the tax hike last year). I also liked its versatility, that you can use it as a body spray, but also to freshen linen and rooms you are in. One thing about it that might bother some people is that the scent doesn’t really linger for long on the skin. Of course, it’s a body spritz rather than an eau de toilette or a perfume, so that is absolutely normal. It does stick around a little longer on fabrics, but it is a very light and fruity scent as I said, and I really don’t mind. I love anything that helps me get through a bottle of perfume of a tube of lipstick. I may be a big weirdo, but I get a wonderful feeling of accomplishment when I get right down to the end and use up those kinds of products. Creams not so much as I get through those super fast anyway – the Body Shop Body Butters are gone in an instant it always seems! To wind down, I really like this scent. Will I buy it again? I’m not sure. I always like to try out new products so we’ll see. I would be interested in trying out their reed infusers, though at 2,700 yen a pop I need to think about it a bit. When you can get scented candles for 108 yen at the amazing 100 yen shop Daiso, it really makes you think twice about these things. Either way, please enjoy your weekend darlings, and have a great week!